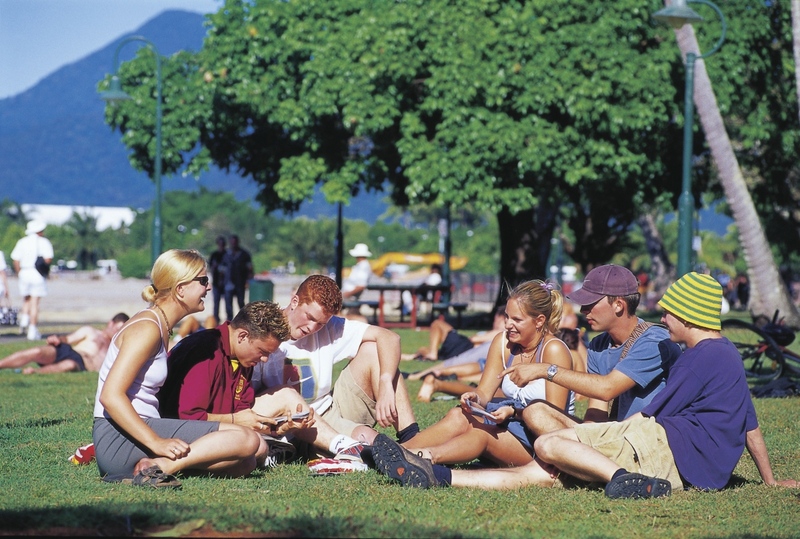 The tropical city of Cairns encourages international students and visitors to explore the city. Here’s some inspiration to get you started with 22 free things to do in Cairns – though there are plenty more! 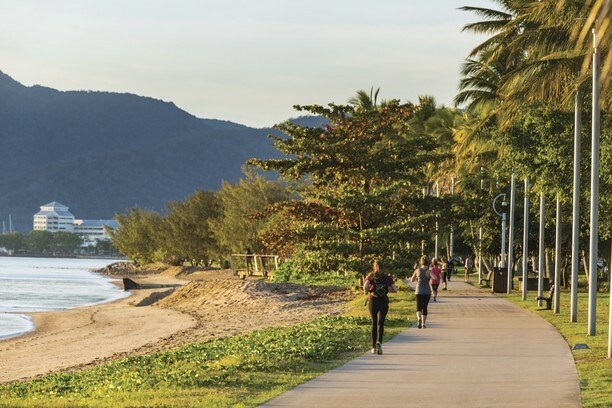 From free exercise classes, rock bouldering, volleyball, skate park and BBQ’s amongst park-lands on the Cairns Esplanade, walking and bike trails, scenic views at Lake Morris and Babinda Boulders, art galleries, libraries and markets, there is something for everyone. And you won’t need to spend a cent! With hundreds of parks and reserves across Cairns and surrounds, there are countless opportunities to explore hidden trails and treasures. Use Cairns Regional Council’s Parks Finder to search by facility or location to find a great park. Are you up for some Zumba Fitness or Qigong Yoga? How about rock climbing or beach volleyball? Pilates or meditation? 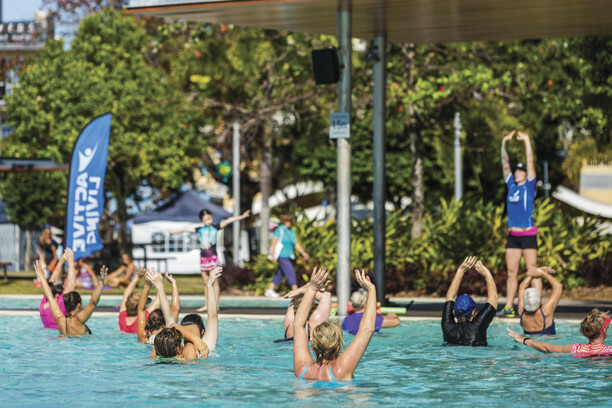 Cairns Regional Council provides free exercise and wellbeing group classes on the Cairns Esplanade. Visit the Esplanade website to find class activity information and timetables for the next classes. With inverted cradle and various other skate elements, the Skate Park on the Cairns Esplanade is adjacent to the Beach Volleyball courts. 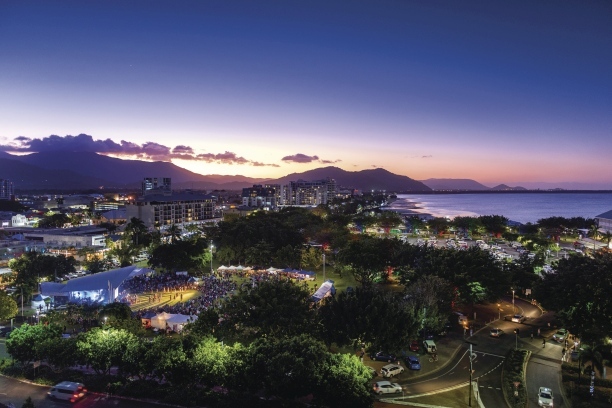 One of Cairns most popular attractions year-round, the waterfront lagoon is Lifeguard patrolled and surrounded by landscaped gardens and free BBQ’s. The Bouldering Park, which offers rock climbing at low heights, on the Cairns Esplanade is open every day and is suitable for novice to experienced rock climbers. On the Cairns Esplanade, three international standard courts are available for anyone to use – just bring your own ball! The Esplanade is dotted with impressive public artworks, sculptures and historical markers – many of them are Insta-worthy selfie spots too! The fish sculptures rising out of the Esplanade Lagoon are probably the most famous, but there are plenty of other artworks along the Cairns waterfront. Oversized murals too are located around the city at various locations thanks to the Cairns Seawalls project. The Tanks hosts local, national and international musicians and theatrical productions and includes an art gallery housed inside restored WWII oil tanks (entrance fees may apply). 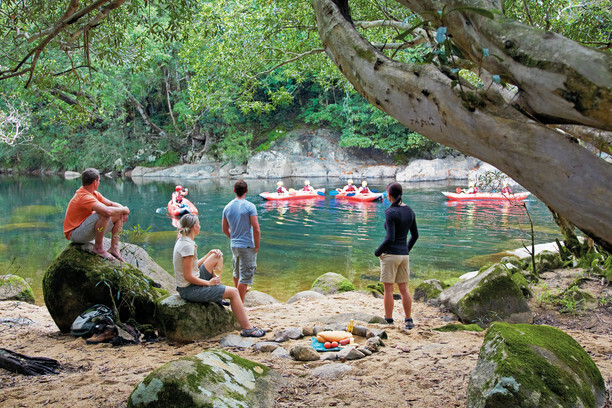 Babinda Boulders is a popular swimming spot and picnic area amid tropical rainforest in the foothills of the Bellenden Ker Range approx. one hour south of Cairns. Cairns has some of the most stunning coastline in Queensland with many beaches that are Lifeguard patrolled for safety (note: stinger season generally runs from November to May when it is highly recommended that swimmers only swim within stinger nets). The Cairns Botanic Gardens precinct showcases Tropical North Queensland’s indigenous species and tropical plants from across the globe. Don’t miss the Conservatory which houses an impressive collection of palms, bromeliads, cycads, aquatic plants, orchids and carnivorous plants. The 80-hectare Cattana Wetlands nature conservation park at Smithfield is home to a wealth of bird and plant life and a boardwalk through fern palm forest. Walking trails, landscaped parklands, boardwalks, birdwatching and the Zhanjiang Friendship Garden on the banks of Freshwater Lake make Centenary Lakes a relaxing and cool place to enjoy nature and the cultural heritage of Cairns. This secluded freshwater swimming hole, hidden in a tropical rainforest, includes a series of small waterfalls and rockpools shaded by forest along with a gentle walking trail, picnic tables and electric BBQ’s. 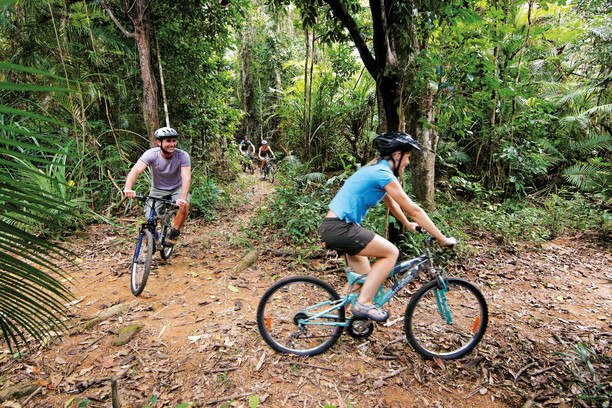 Cairns has an extensive network of walking paths, bike tracks and cycleways across the city. For mountain bikers Smithfield Mountain Bike Park is world class. 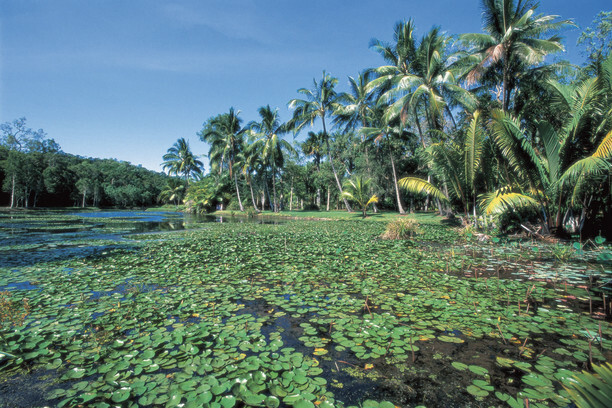 Download the free maps and take one of five heritage trails around Cairns city and surrounds. Further afield, take the Southern Heritage Drive, a journey of approx. 180km that explores Cairns sugarcane history. Inspired by well-known marine biologist Jack Barnes’ interest in box jellyfish and the mangrove environment, the Mangrove Boardwalk offers a safe and intimate view of a living breathing mangrove forest. 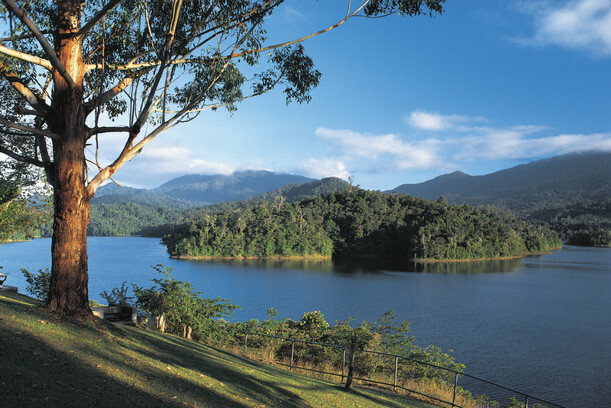 Lake Morris Road is a steep but scenic road that winds up through the range west of Cairns. A popular training route for runners and cyclists, the views of Cairns and the islands beyond are the reward. At the top the rewards are even better with BBQ’s and picnic tables overlooking Lake Morris a great spot for a casual lunch. Across the city there are eight libraries offering a wide range of books, magazines and newspapers, DVDs, and audio books along with free internet access and wi-fi. Local markets are a terrific place to meet some locals and soak up the atmosphere of Cairns. 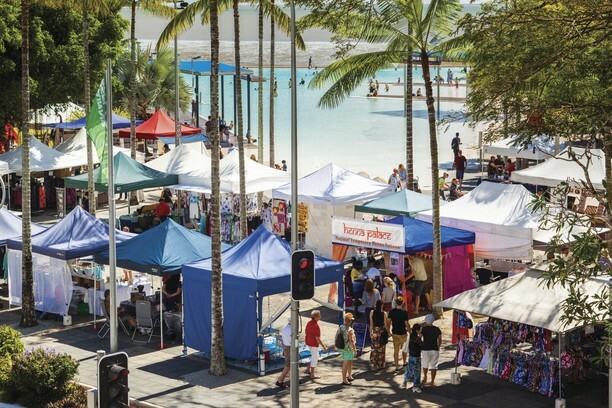 The Esplanade Markets are held each Saturday near the Lagoon while other markets are held in various parts of the city and surrounds, such as Atherton, Kuranda, Malanda, Mareeba, Palm Cove and Port Douglas. Some of Cairns best (and challenging) walking/running tracks, The Red, Blue, Green and Yellow Arrow Trails wind though the 300ha park with terrain varying from smooth bitumen to forest trails. The Glacier Rock trailhead starts from Rainforest Estate, gradually winding upwards through forest, along some switchbacks that offer views across Cairns and the islands beyond and ending on the top of a craggy rockface high above the city.